Mizfit was discussing child obesity the other day, and one of the things that can help the kids get and stay healthier is to give them better quality snack foods. But when does a busy mom or dad have time to do snack planning? Well, not to worry parents. 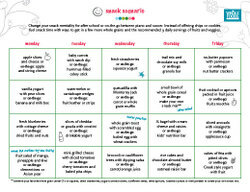 Whole Foods has created this nifty kid snack planner worth a whole month of ideas. Very cool indeed.